Find out more information about this pattern here. It has been a few months, but while my Mom was visiting recently I picked up my Intertwined quilt to finish the hand quilting. It really doesn't look much different than last time I shared it, but it took a whole bunch of time so it is getting its own post. Originally I had quilted lines in each of the prints/colored solids that were 1" apart, but that left the background squares blank. 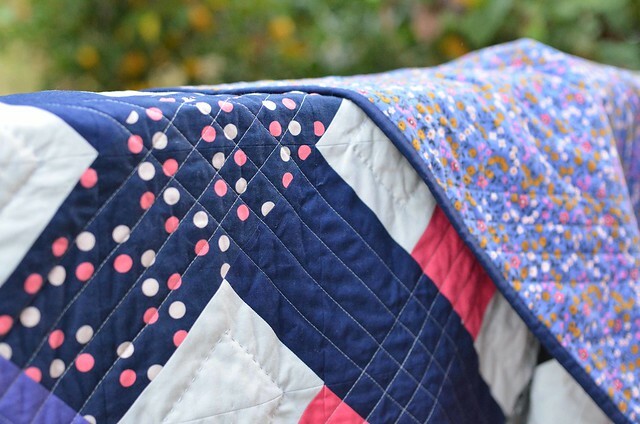 It was the perfect opportunity for a little hand quilting. I used some silvery grey Valdani perle cotton and did some chunky stitches. It's nothing major, but I like how it turned out. This quilt is now available in my Etsy shop. Finished size: 63" x 70"
I am working on a pattern for this quilt (though it will be constructed differently) and am looking for at least one more pattern tester. I am going to write instructions for a baby, lap, and twin size version. Is anyone interested in testing for me? I have received several emails this morning from people offering to test the pattern. Thank you! 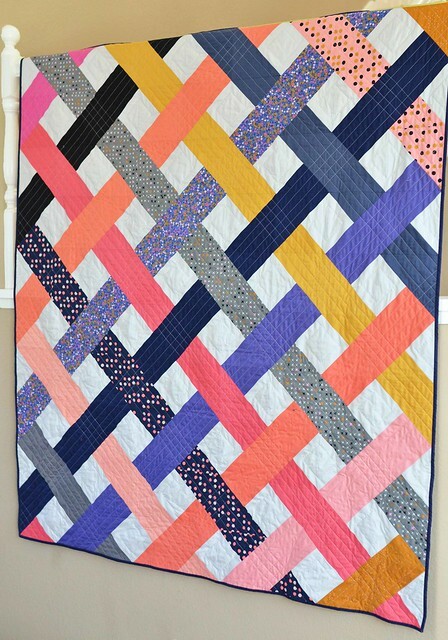 What a bright and beautiful quilt. Love the pattern! Beautiful! The link to your shop isn't working though, it tries to take me to the admin side of the shop instead of the consumer side. I eventually found it though, you have beautiful stuff listed!